MakersValley Be Inspired projects have streamlined the jean manufacturing process to help you discover a high quality factory that can create a unique pair of denim jeans. It's easy, and the best part is, you can make your jeans in just 5 easy steps. Check it out! And don’t worry, if you get stuck on your project, your MakersValley Account Manager will be on standby to answer all your questions and help you through each step of creating your private label jeans. A Be Inspired project lets you browse (for free!) thousands of white label samples in the Be Inspired Catalog, uploaded by our network of 150+ Italian manufacturers. What is white label? White label samples are established products 100% Made in Italy that have already sold to brands worldwide. With MakersValley, our manufacturers make them available to you. Each denim jeans sample you see has a number of customizations available from the jeans factory. 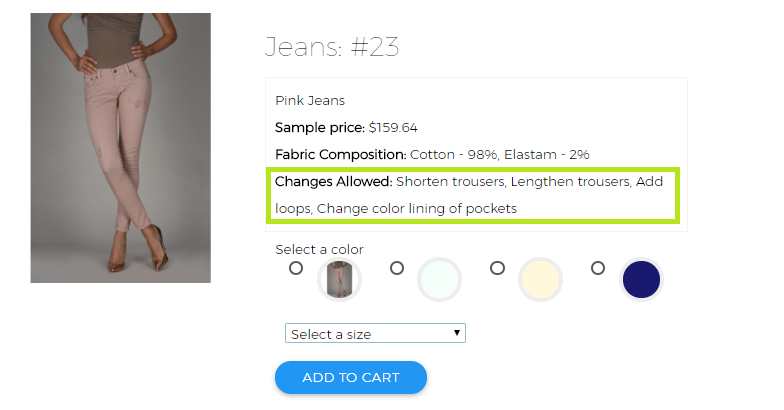 You'll be able to customize the jeans in step 2, but first we want to send you a sample to make sure that you have a chance to study and review the product first. Select and order any white label denim jean samples that catch your eye. To submit your order, you’ll need a MakersValley membership plan. Once you’ve signed up to the plan that works best for you, click Submit For Review on your project, and shortly after you’ll receive an invoice for your Be Inspired samples from your Account Manager. Once you receive your Be Inspired denim jeans sample, log into your account and complete the easy feedback questionnaire. Here's where you can make customizations to the product. Generally, the jeans factory will allow you to customize the jean length (longer/shorter); add/remove pockets, add belt loops, and change the color of the lining inside the pocket, as shown below. Be sure to check out our FAQ to see a list of the jean factory's acceptable denim jeans customizations. Additional customizations beyond those listed may result in a new product pattern. Once you complete the questionnaire, a new Bring to Life project will be created in your account using the information you provided in your questionnaire, about the denim sample. Go ahead and submit the project so you can start getting factory bids for your prototype (aka. your white label jeans sample with your customizations). Once your project is approved, you’ll receive manufacturing bids from 150+ Italian manufacturers via the platform, within 10 business days. Once you accept the winning manufacturer bid, your project will match to that jeans factory. Your Account Manager will then invoice you for your first product sample. At this point, you may want to know how much it costs to make your own jeans. Check out our calculator to get a budget estimate. 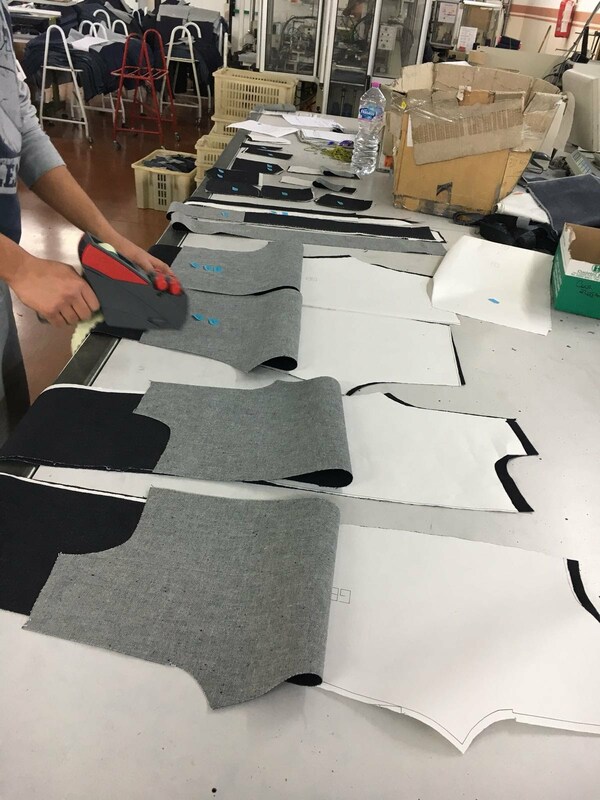 Once your project is matched to a jeans factory, they'll start making your first garment sample with all of the customizations. Once that's ready to go, your Account Manager will invoice you for shipping. When you receive your first jeans sample in the mail, give us your feedback on the Platform. Did it come out to your liking? Use the Platform to either approve or reject the sample. Love your jeans sample the way it is? Fantastic! Once you've approved your prototype, we’ll send you the production invoice + estimated shipping & customs invoice. We’ll get you a quote for your second jeans sample, with the changes you requested. You’ll need to write your modifications to the 1st sample in your Bring to Life project and let your Account Manager know about it. Congrats – you’re at the final step! Watch as your factory brings your dream jeans to life, then, receive your production order at your door, and start selling. Now you'll have something really special to tempt customers: a pair of 100% Made in Italy jeans with your brand label on them. Log back into your account anytime, and tell us when you’d like to repeat your denim jeans in different colors, different styles, or in the original design (trust us, you’ll sell out fast!). NOTE: Production orders typically ship out six weeks after the factory receives your approved sample back in Italy and we confirm your production payment. Your Account Manager will keep this process easy by handling all the logistics to get your production order from Italy to you.